Organization is vital for the success of every business or enterprise. 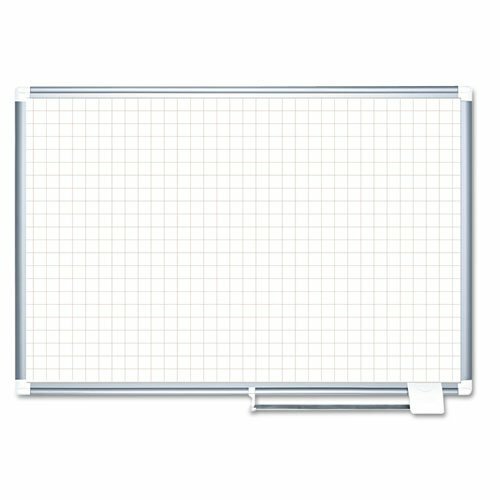 MasterVision Planning Boards are excellent tools that allow you to keep planning and tracking on time. Keeping important tasks on display, organizing work-groups or just planning ahead is practical and easy. Pale gray grid lines help ensure easy alignment of text and magnetic accessories. Magnetic Gold UltraTM dry erase surfaces is suitable for frequent use and allows you to post notes and messages as well as write. Sturdy aluminum frame features a sliding pen tray and the four-corner system for easy mounting. Sold as 1 EA. Magnetic Gold UltraTM lacquered steel dry erase surface is recommended for frequent use. Four-corner system for easy mounting. If you have any questions about this product by Bi-silque, contact us by completing and submitting the form below. If you are looking for a specif part number, please include it with your message.